Keep colors simple and consistent. Include a call-to-action (and update it regularly). Include social icons linking to your social profiles. Let people book your calendar right from your email. Include an international prefix in your contact number. The average office worker sends 40 emails per day. That's 40 opportunities to market yourself and your business in those individual emails you send, every single day. A lot of people treat their email signatures like an afterthought, which makes for a real missed opportunity. Those signatures are a chance for you to make it clear who you are, make it easy for people to reach you, and give people a place to go to find out more -- either about you, about your business, or about something you're working on. So, what does a great email signature look like? Here are some tips for creating ones that are helpful and professional, including a few great examples. You can use HubSpot's free Email Signature Generator to make your own professional email signature template and easily add it to your email provider. 1) Keep colors simple and consistent. Branding is most effective when it’s consistent -- and that includes your email signature. Adding color to your email signature is a nice touch that'll help it stand out from the rest of your email. But if you do choose to use color, be sure to stick to one or two in addition to dark text. Use subtle highlights to match your logo or branding, like Brittany Hodak does in her email signature. 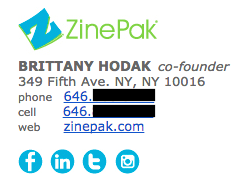 Notice how her social media icons are the same blue hue as the ZinePak logo. Good design is all about presenting your information in an easily digestible manner. Because your email signature is likely more a list of information than it is a compelling story, you'll want to use hierarchy to direct readers' eyes to what they should be reading first. Scale your name up to a larger font so that it attracts the most attention, like you would on a resume. Then, pick and choose information to bold and color based on importance so you can help guide people's eyes logically through the design, as in the example below. 3) Include a call-to-action (and update it regularly). One of the smartest things you can do in your email signature is include a call-to-action. 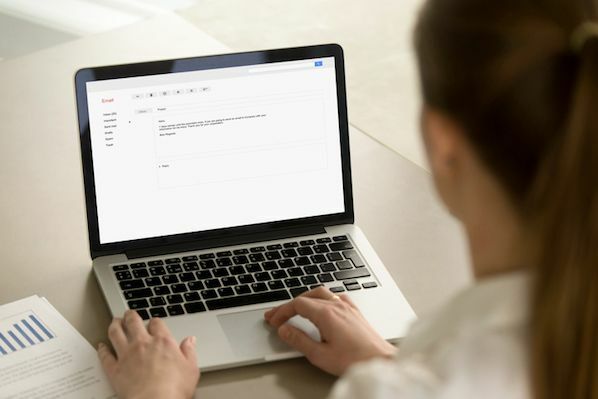 The best email signature CTAs are simple, up-to-date, non-pushy, and in line with your email style, making them appear more like post-script, and less like a sales pitch. Choose a CTA that aligns with one of your current business goals, and update it when those goals change. Here's a great example from our own Social Media Manager Chelsea Hunersen. She changes her text CTA depending on her current social media goals. 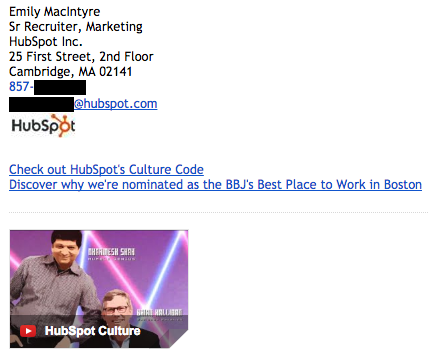 A few months ago, she used it to drive people to HubSpot's Twitter account. 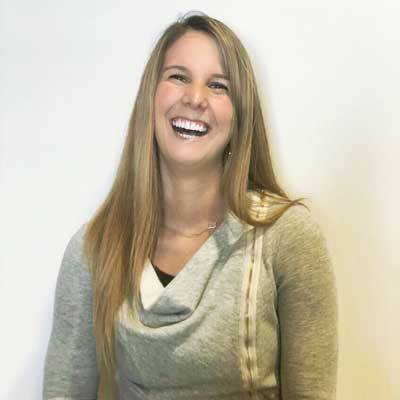 Once she created a unique Slack channel for inbound marketers, she switched up her email signature CTA to point people there, instead. 4) Include social icons linking to your social profiles. Your social media presence is a major part of your personal brand because it helps you gain a following in your space and shows people what you care about. You can tell a lot about a person by what they post and how they portray themselves. 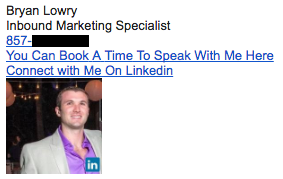 That's why it's a great idea to include links to your social media pages in your email signature. It not only reinforces your personal brand, but it also helps people find new ways to contact and follow you. Why use social media icons instead of simply text links? Because icons are more easily recognizable for folks skimming your signature -- and they'll stand out from the rest of the text in there. According to research from Neomam Studios, it only takes the human mind 150 microseconds to process a symbol, and 100 microseconds to attach meaning to it. That's super fast. Plus, icons are big space-savers in a place where you might be packing a lot of information. Even if you have a presence on a lot of social media sites, though, try to cap the number of icons to five or six. Focus on the accounts that matter most to growing your business or building your personal brand. So you put a few links in your email signature, including your CTA and your social media icons. But is anyone actually clicking on them? To figure out whether the links in your signature are actually attracting clicks and making an impact, you'll want to make those links trackable -- just like you would any other link in your emails. Follow these instructions to easily make your links trackable. You might switch up the format of your signature or the wording of your calls-to-action from time to time to see what drives the most clicks. Although you never want to jam-pack your email signature for too much information, there are ways to fit a lot of text into a compact area like this one without compromising design. This is helpful for breaking up different types of information, like your name and contact information, your logo, any calls-to-action you have, or even a disclaimer. 7) Let people book your calendar right from your email. There are many tools out there that'll help people book appointments. Bryan from the example above uses HubSpot's shareable personalized booking link. If you're a HubSpot Sales customer, you can share your personalized meeting link with anyone who you want to book a meeting with and let them choose from your available times. If you want, you can make it so the HubSpot CRM automatically creates a new contact record for anyone who books a meeting if one doesn't already exist. 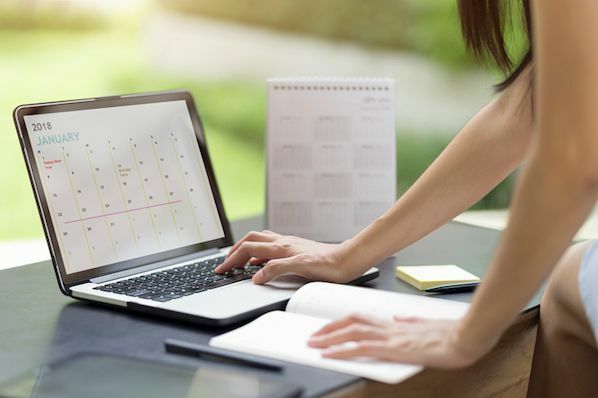 If you aren't a HubSpot customer, one great meeting tool is Calendly, which is free for Basic and lets you integrate your Google or Office 365 calendar. YouCanBook.me is another booking tool that goes for $7 per calendar per month. 8) Include an international prefix in your contact number. If you work with people around the world, don’t forget the prefix for your country’s code when you list your contact phone number. Many people overlook this if they aren't used to dialing international prefixes themselves, but it's really helpful for your international colleagues and clients to have it right on there. Here's a list of country codes if you don't know yours. Here's an example from Kit Smith of Brandwatch, a company that has offices in both the United States and Europe and works with international clients. Having the U.S.'s country code on their helps make it easier for folks in other countries to reach him by phone. 9) Make your design mobile-friendly. In Litmus' analysis of over a billion email opens, they reported that 56% of opened emails were opened on mobile devices in April 2016. This figure represents an 8% increase in mobile opens in the past year. The more people who read email on mobile devices, the more you'll want to keep mobile users top-of-mind when you're writing emails -- including your email signature. One major way to make your email signature mobile-friendly is to make your signature's design easy to read and clickable for mobile users. This is where scale becomes really important. Make sure your text is large enough to read on small mobile screens, and that your links and buttons are large enough -- and spaced out enough -- for folks to tap on with their fingers. Check out the example below, and note how much space there is between different clickable elements like the social media icons. These are great for tapping with your finger on a mobile screen so that users don't accidentally tap on the Facebook icon when they meant to go to Twitter. Finally, as with any part of an email, make sure your signature looks as good as you think it does by testing it with various email clients. Microsoft Outlook doesn't recognize background images, for example, so avoid using those. Other email clients don't load images by default at all. Read this blog post to learn how to optimize emails for different email clients. 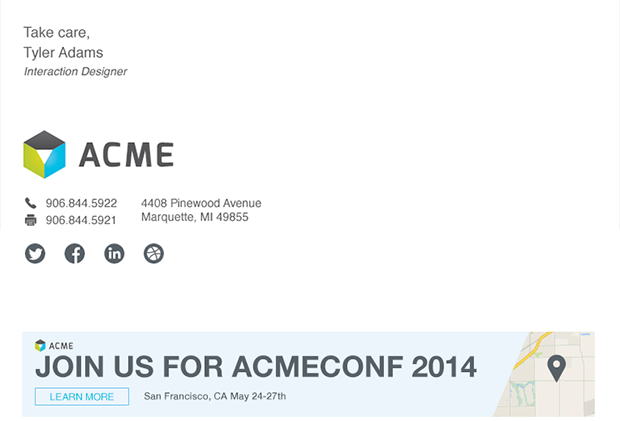 What examples of great professional email signatures have you seen? Share with us in the comments.